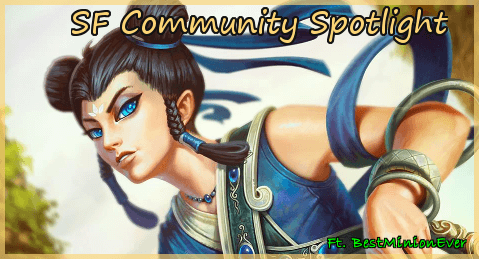 Hello all and welcome to the April 2018 Community Spotlight! This month's interview features BestMinionEver! Since becoming a member of the website more than 5 years ago, BestMinionEver (otherwise known as Marki) has published numerous guides, kept users up to date on his ranked progress through the use of Blogs and shared his knowledge on jungling and all other aspects of playing SMITE in the little-over-2000 comments he has posted to this day. We felt it was about time for him to share more in regards to his experiences on SMITEFire, his time playing SMITE and his personal life, so let's get right to it! 1. In February 2013, you joined the website by registering an account under the name 'BestMinionEver'. What's the story behind this nickname? If you made a new account today, would it be named the same or would you prefer your IGN (Marki)? I basically thought the account name worked the same way as for SMITE (that you have one login name and one in game name), so I always wanted to have Marki as my nickname. I was just too lazy to make a new account. The story behind BestMinionEver is just that I was playing Borderlands a ton back then and it is a joke in honor of Claptrap. 2. In the five years that followed your decision to join the website, what made you decide to keep coming back? What is the best part about SMITEFire in your opinion? I just like the way you can reference items/abilities when posting or for guides. It just makes it so much easier to have discussions and explaining stuff without having to search for the information. 3. Who do you remember to be (one of) the first member(s) you interacted with, years ago? Are there any members from back then that you miss talking to? So I'm just looking at my inbox now and the first members I interacted with were RazeMage and Ragingstorm to help me when I was making my Ne Zha guide (coding and stuff). I also reported some guides and got Mowen to archive them, she also even banned a member lol. One of the first members I really interacted with was vatechfan who me and my team of friends played some scrims with and I continued to play some with him. Same goes for Alkahest, who I created a team with for the challenger cup (I think we won 1 game then got dumpstered by iRaffer's team), also played WoW with him and stuff as well. 4. Over the years, you've published several guides on the website. Are you currently working on any new ones, or are you planning to in the near future? I am kind of working on a general guide to ranked (how to get out of "elo hell") and updating my Ne Zha guide. Also want to update my counterjungling guide and maybe make it into more of a jungle guide. But I work just as fast as George R.R. Martin, so don't expect me to ever get any of them done. 5. Imagine the SF reigns were handed over to you and you would be entirely responsible for all future site updates. What is the first change you would make / new feature you would implement and why? I would love to add a chat, or at least advertise the Discord channel on the front page somehow and implement a way to see what members are online at any given time. That way you could at least make some more use of the PM system. I would also archive 75% of all the guides probably, so don't hand me the reigns. I do think a system where a guide automatically gets archived if it has x amounts of votes and x% is downvotes could be nice. 6. Moving on to SMITE and MOBAs in general: What is your MOBA background like? Is SMITE the first (and only) one you've played? How much do you enjoy playing them now vs. when you first started doing so? I played some DotA at LANs with my friends back in the old days (guess it is about 11 years ago). I did not play it much, but I do remember my friends trying to teach me the game. I then played some LoL with my brother and his friends a while (must be 6-7 years ago), but I never really enjoyed it unless I had multiple people to play with. I also played a bit of HoN with a friend from uni (also 6-7 years ago). I never liked the top-down view of those games, but I did always enjoy the theorycrafting aspect of the games. I have been thinking about maybe trying some LoL again or check out DotA 2, but it would probably just be for a few games with some friends. Can't see myself ever going back to play a top-down MOBA seriously though. 7. Who is your favorite jungler at the moment? Also, do you have an off meta pick for the jungle role which you like using in normal (or even ranked) games? I actually like Tyr jungle (though I have not played it in forever) and Anubis of course as well as Ares. 8. You regularly use SF Blogs to keep us up to date on your ranked progress, but what is your goal for ranked this season? Do you plan to stop at Platinum/Diamond/Master, or keep grinding until you reach the competitive scene? 9. While climbing, it is important to keep up with the top competitive picks and bans. In your opinion, what would you say those currently look like for each role? Do you see them changing any time soon? I actually don't think picks matter much before you get into Diamond/Masters matchmaking. Below that it is more important to play gods you know well. Of course it helps if you know the top picks well, but I would rather have an Anubis that plays very well than a Janus that plays mediocre. I don't see them drastically changing any time soon, but we'll see what happens in the next big patch. The support and solo picks are probably not changing any time soon though. 10. Finally, it is also important that you're able to reflect on your own play. With that in mind, what would you consider to be your biggest strengths and weaknesses as a player? Game knowledge is my biggest strength and I'm average at overall gameplay (calls, positioning, etc.). My biggest weakness is probably mechanical skill and teamfights. 11. In this last section, let's get to know a little bit more about you as a person. What is it that you currently do outside of the forums, and do you have any future career plans to share? I am done with my Bachelor degree as a laboratory technician (bioengineer) and I work at a hospital (the Aker University Hospital in Oslo) taking blood samples, analyzing those blood samples, keeping the analyzing instruments up and going, etc. At the moment I am on leave from that position though and I work as a "special bioengineer" (for Rikshospitalet, but still stationed at Aker), specialized in working with the laboratory's IT-system, just making sure results are sent correctly and making sure everything runs smoothly. Currently the plan is for me to keep doing that until November this year, but we're probably getting that extended. I hope to muster the willpower to do some more studying inside hospital IT just to have a better chance of getting a permanent position. Outside of work, I have plans to do some work on the apartment, since I need new flooring on the balcony and I need to fix the window frames. I really enjoy cooking, so I have actually thought about taking some advanced cooking lessons just for fun. I also need to start working out again. In the world of gaming and such, me and some friends are getting together to play some "serious" SMITE again with 4-5 man queues playing casuals, maybe even do some scrims for fun. I'm also enjoying Magic the Gathering at the moment. I play some MtG-online and MtG-arena from time to time and I have some friends that I play paper Magic with as well. I think I will try to go to some more FNM draft events (went to a few before Christmas, then I stopped). I also have a ton of single player games that I want to finish (playing some the Witcher 3: Wild Hunt at the moment). And then there is Netflix and chill with the girlfriend. That is basically it I think. 12. Do you play any other games besides SMITE? Which would you consider to be some of your all-time favorites, and what do you love about them? 13. What kind of music do you generally listen to, and what are some of your all-time favorite artists & songs? I listen to a lot of different music from the general top 50 stuff: rock, classic, Hip-Hop etc. I can't go a day without Spotify and it is really hard to pick an all-time favorite. My favorite artists at the moment are probably Nomy, Disturbed and Alan Walker. I think Disturbed is my all-time favorite, I've listened to them since I was like 15. My favorite songs at the moment are Country Lines - Kevin Meisel, Friction - Imagine Dragons and Get a name - Nomy. My all time favorite song is Handlebars - Flobots though I think, mainly because of the music video. I remember watching it over and over in class when we where at the computer lab in 7th grade. 14. Are there any places in the world you would love to visit but haven't had the chance to? I still haven't visited England and I got a fair amount of in game friends that I would like to visit in England. But in general I just want to visit any place where it is sunny, there aren't any I'm sad I haven't visited yet. Coffee or soda? Coffee, I'm not a big fan of bubbles. I do enjoy soda, but a lot of the time I would rather go for a cold glass of water. Beer, wine or liquor? Beer, but I need to cut down on beer to watch my weight so for now it is liquor, preferably whiskey or vodka (Norwegian potato vodka called "Vikingfjord"). Beef, pork, chicken, fish or veggies? Definitely beef or chicken, but bacon is also dope. I do not mind a vegetarian dinner from time to time either. I'm also Norwegian, so I eat fish 2+ days of the week. Soup or salad? This is a hard one. Soup in the winter and salad in the summer. Bread or cereal? Bread, or homemade cereal with yogurt. Pizza or pasta? Pasta, pizza just takes too long to make. Pizza is nice in the weekend though. Rice or potatoes? I prefer rice, but I end up making potatoes most of the time because Norway. Waffles or pancakes? Pancakes if I'm cooking, but the girlfriend makes some tasty waffles. And I really love me some fresh waffles with a bit of butter, strawberry and sour cream. Cake or ice cream? Ice cream in general, but I love cheesecake and apple cake. Chocolate or vanilla? Is that even a question? Chocolate of course. Ahhaha great interview. Would love an embedded chat on the site. Awesome info on your varying job responsibilities. I have no clue about any of those music groups. but a lot of the time I would rather go for a cold glass of water. Lol I like how you keep referring to your GF as "the girlfriend"